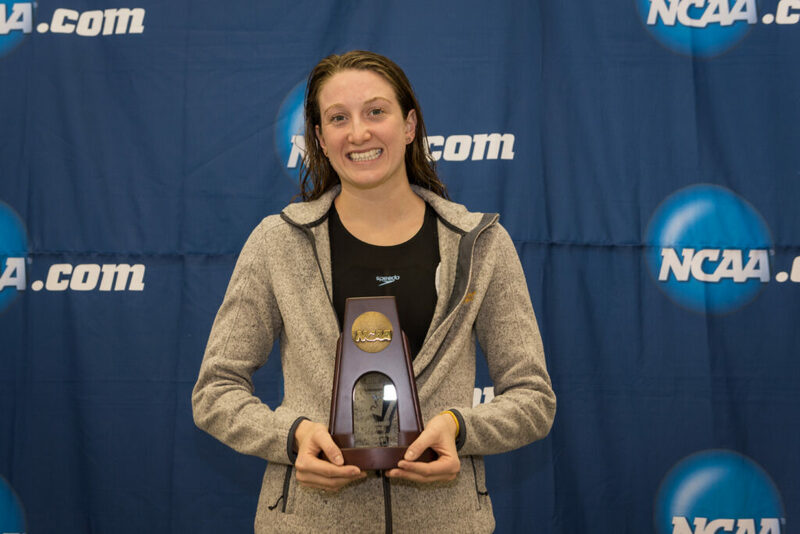 UMBC swimming and diving standout Emily Escobedo ’17, psychology, won bronze in the 200m breaststroke at the NCAA finals on Saturday, becoming the first Retriever to earn All-American status in the pool. “This weekend was amazing because of Emily. She never let the competition get to her… She can step up in any situation and give her best,” said head coach Chad Cradock. Escobedo earned a spot in the A finals after finishing in a tie for second in the prelims, touching the wall in a time of 2:06.82. In the finals she finished with a time of 2:06.43 to earn bronze, scoring enough points to earn All-American recognition, adding to her Honorable Mention All-American status from competing in the 100m breaststroke. Before swimming in the final, Escobedo spoke with Swimming World Magazine and credited her strong performance at the meet to her supportive team and the UMBC community cheering her on. When Emily’s teammates learned they weren’t able to join her at the meet, they sent her a 12-minute pump-up video full of encouragement. The All-American honors add to Escobedo’s growing list of accomplishments, which include earning America East Rookie of the Year and Swimmer of the Year twice, earning multiple trips to the NCAA Championships, and becoming the first Retriever to score at the national meet. Escobedo finished with a total of 18 points, placing UMBC 29th on the final team results, ahead of Arizona State, Northwestern, Auburn, the Air Force Academy, and Harvard. Escobedo’s swim concludes a memorable season for the Retrievers, with the UMBC women’s swimming and diving team winning its second straight America East championship and the men’s swimming and diving team winning the 2016 Coastal Collegiate Sports Associate Championship, posting 24 new all-time top-10 swims during the meet. Cradock ’97, psychology, a member of UMBC’s Athletic Hall of Fame who has coached the team since 2001, was named Men’s Swimming Coach of the Year at the CCSA championships. Images: Emily Escobedo earns bronze in the 200m breaststroke of the NCAA swimming finals, 2016. Top image by Tim Binning, The Swim Pictures; second image by Reagan Lunn.